Paramol combines Dihydrocodeine with the tried and tested pain relief of paracetamol, giving you a powerful way to fight pain. For the treatment of: headache, migraine, feverish conditions, period pains, toothache and other dental pain, backache and other muscular pains. Do not use if suffering from thyroid, kidney or liver problems, are pregnant, breast feeding, or have asthma or breathing difficulties. Strongest pain killer available over the counter. 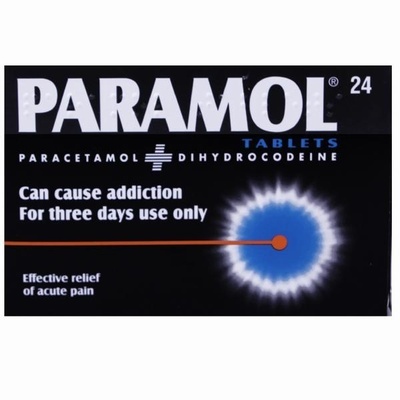 Contains 7.46mg Dihydrocodine and 500mg Paracetamol.